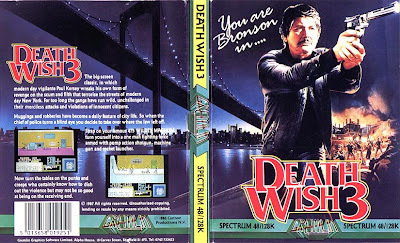 Given the popularity of Charles Bronson & the success of The Death Wish franchise in the mid 80's it came as no surprise that Bronson would star in his very own video game. 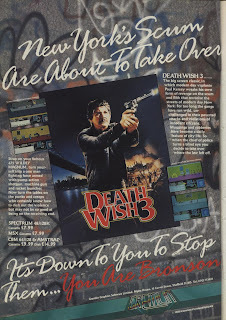 Death Wish 3 the game was released in 1987 by Gremlin Graphics Software Ltd & was released on the Spectrum Sinclair, Amstrad CPC & Commadore 64 systems. It retailed for a modest £7.99 in the U.K. Unfortunately back in those days film tie-ins were often rushed out without a great deal of detail or care put into the game itself. The publishers would gain the rights to use the film tie-in and then want to release the game as soon as possible to make as much cash as quickly as they could. Death Wish 3 is no exception to this rule. Whilst the graphics for it's time are pretty sharp the gameplay even back in 1987 left little to the imagination. 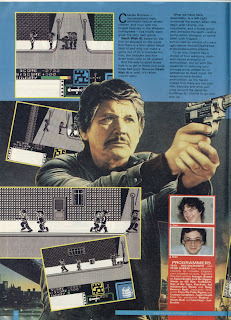 Walking around blasting bad guys away constantly with no variation meant the game would become tedious & dull very quickly. 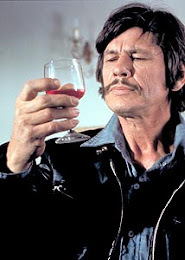 Still for us mere mortals this is the closest you'll probably ever get to being Charles Bronson! For far too long, ruthless and merciless gangs have terrorised the streets. of the punks and creeps who infest the streets. leaders, lolling around behind their desks are your prime targets. Watch Death Wish Netflix online free on zmovies now. I'm not a big fan of remakes. I think the huge flow of remakes coming out of Hollywood these days shows a lack of creativity. Although the general story line is pretty much the same as the original there is enough difference to keep it interesting. 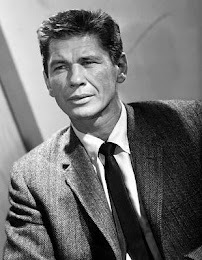 Willis portrayed the torment Kersey was going through well, and in this respect he played the part better than Bronson.